We believe that BioClair Digestive Enzymes should be part of your first aid kit. This fabulous formula has been developing and improving for about 20 years now. The formula was originally created to help a family member who experienced chronic suffering from symptoms of GERD (gastro-esophageal reflux disease); you know that painful burning sensation in the stomach, chest, esophagus and throat. BioClair Digestive Enzymes taken regularly before meals have been shown to relieve painful symptoms. As we shared the enzymes with family and friends over the years, we realized that it was also suitable for people who occasionally experience digestive issues, either from over-indulging in a rich or spicy meal, or were out eating and drinking too late and then were in discomfort or possibly couldn’t sleep because their digestive system was in over-drive. We have come to understand that BioClair Digestive Enzymes do not have to be taken with every meal to be effective, although you absolutely can take it with every meal. This is an enzyme product that you can take as you need it and that’s why we recommend that BioClair Digestive Enzymes be part of your first aid kit. We keep enzymes in their pockets or purses ready to share as do many of our family and friends. The goal of BioClair is to deliver effective natural Non-GMO products to the market, with each of our products designed to relieve and reduce suffering and to enhance the body’s own healing capabilities. Our goal is to bring effective natural products to the market to help relieve and reduce suffering. In 2012, it became clear that these digestive enzymes could help many more people. Our ingredients are put together to make the best, safest formulas to reduce suffering. Jill shares how BioClair Digestive Enzymes help her food allergies, food sensitivities and hypoglycemia. It helps stabilize her blood sugar levels and mood. Kelly shares how BioClair Digestive Enzymes help her bloating and digestive discomforts. Her memory, focus, and energy levels have also improved since taking the enzymes. BioClair Digestive Enzymes have been very helpful. I unfortunately have issues when digesting dairy products. I have tried taking lactose pills, which are supposed to help with digestion but never do. BioClair Digestive Enzymes are almost instantaneous with its relief. If I know I'm about to eat a meal that contains dairy, I take a few enzymes and it's as if I never had any dietary issues. If I've eaten something that has dairy, my stomach will hurt almost immediately. But if I take a few enzymes, the pain relief is very fast and really does help with the indigestion. 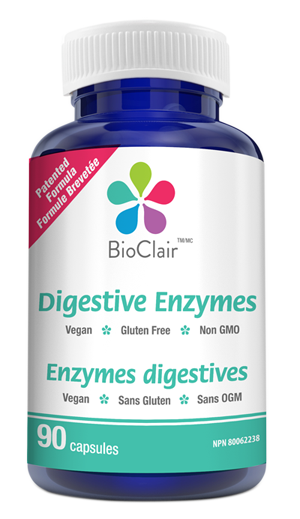 BioClair Digestive Enzymes are great anytime you are having digestion issues. I recommend this product to anyone who has dietary issues as it is fast-acting and really works. My personal experience with BioClair Digestive Enzymes has been over the top. From time to time, I have experienced that incredible heart burn symptom at 2 or 3 o’clock in the morning, waking me up where I can’t sleep. Heading straight towards my bathroom, I grab the BioClair Digestive Enzymes bottle and I take 3 capsules. Within 20 to 30 minutes the pain is gone and I am able to fall back asleep again. I do not leave home without it. I even keep a bottle in my car. I give it to my friends, which has saved many evenings which otherwise would have ended earlier. Thank you BioClair.